Recently we profiled Card Shack in Lynbrook, New York as a Featured Retailer because they have been a great shop for collectors and have been going strong now for 25 years. We put together a package of goodies for their big celebration and we were really happy to see a couple of the images the owner Steve shared with us proving that kids still love collecting. Thanks so much for working to keep kids engaged with the hobby Steve and here’s to another 25 years of doing business together! 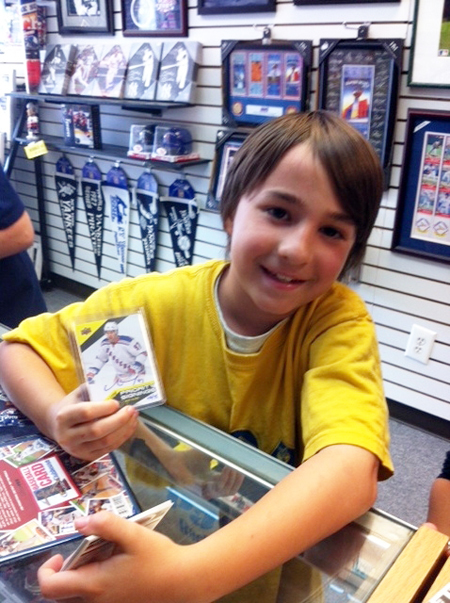 A youngster smiles after receiving an authentic autograph promotional card from a member of the New York Rangers! Steve has cultivated a strong following of kids who collect in his shop. Here all the boys blow some Upper Deck whistles we provided for the celebration!